3 Garnets & 2 Sapphires: Santa Stopped By Our House Tonight! Santa Stopped By Our House Tonight! The children are finally all asleep, although I can tell they are not sleeping soundly. This was after we made our traditional preparations for Santa's visit. We hung the magic key outside for Santa, so he would be able to enter the house. 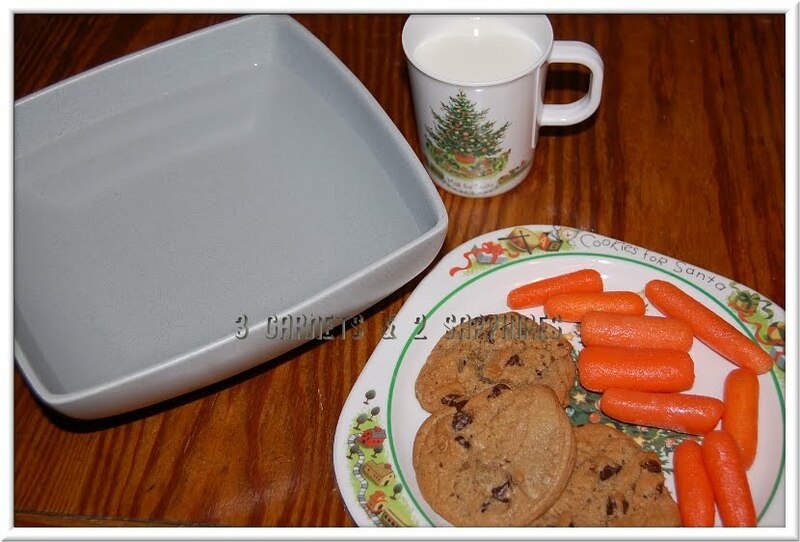 Then we left cookies and milk for him plus carrots and a big bowl of water for the reindeer. Before bedtime, instead of my husband reading "The Night Before Christmas" to our children, we presented them with a Hallmark Recordable Storybook for the same story. My husband recorded himself reading from each page of this book, so the children were able to hear the story just by turning the pages. All three children were delighted, but our nearly 4 year old daughter was practically giddy as she listened to the story. After the story was done, my husband asked the children if they knew whose voice was reading the story and they all said "Santa Claus!" My husband did an especially good job recording the story, especially since he is just getting over a case of bronchitis. Perhaps that is why the children did not recognize his voice? Shortly after the children were tucked into bed, our nearly 4 year old son kept calling us. He just had to tell us that he was sure he heard something on the roof. Perhaps he did . . . 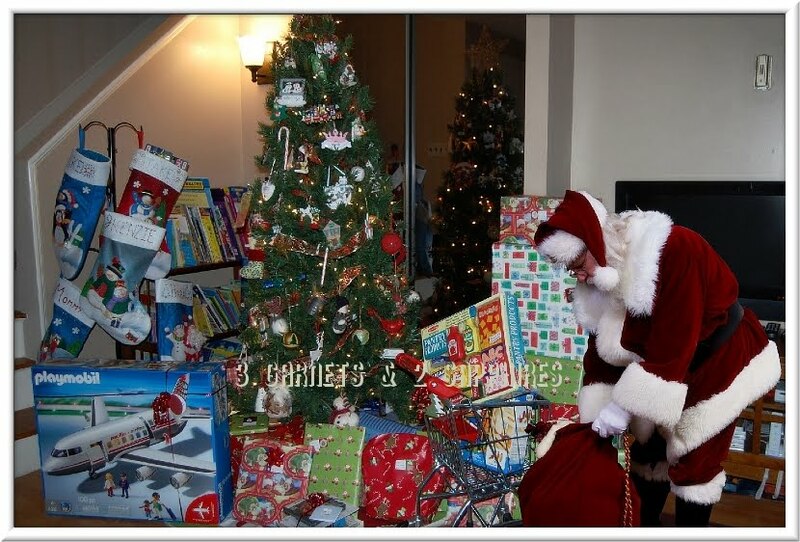 I created this photo on iCaughtSanta.com . 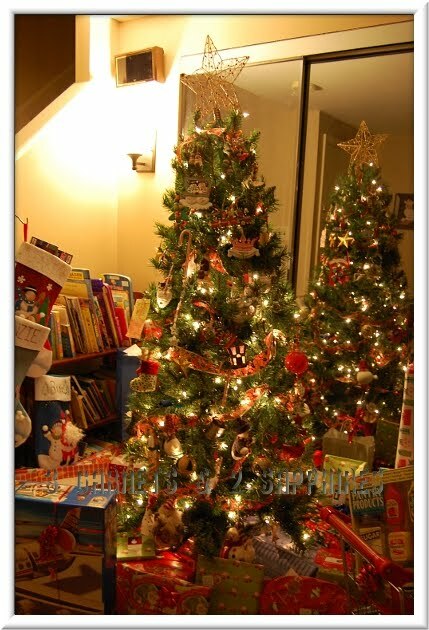 I have used this site and its related sites to create photos of Santa and of the Easter Bunny in our very own living room. I cannot wait for our oldest son to lose his first tooth so I can make one of the Tooth Fairy standing by his bed. I received a gift code for a complimentary digital photo to facilitate this review.